I’ve noticed that many nonbelievers (and even believers) misunderstand what constitutes a “God of the gaps” argument. They tend to think one is guilty of a God of the gaps argument if they offer God as an explanation for some X rather than some natural phenomenon. The problem with this definition is that it presumes the only valid explanation is a naturalistic explanation. God is ruled out as a valid explanation for anything a priori, so anyone who offers God as an explanation for X is thought to do so merely because they are ignorant of the proper naturalistic explanation. This begs the question in favor of naturalism and against theism. One could only conclude that every effect has a naturalistic explanation, and that God is not a valid explanation, if one has first demonstrated that God does not exist. So long as it is even possible that God exists, then it is possible that God may be the cause of X, and thus explain X. What makes an argument a God of the gaps type of argument is when God is invoked to explain X simply because we do not know what else can explain X. In other words, God is used to plug a gap in our knowledge of naturalistic explanations: “I don’t know how to explain X, so God must have done X.” This is not at all the same as arguing that God is the best explanation of X, based on what we know regarding X and the explanatory options available to us. Here, God is being invoked to explain what we know, not what we don’t know. A good example of this is the origin of life (Parts 1, 2, 3, 4, 5, and 6). We have plenty of knowledge about how life works, the minimum requirements for life, and the productive capacity of naturalistic and intelligent processes. We know the basis of life is biological information encoded in DNA. Even the simplest forms of life require massive amounts of biological information. We also know that unguided naturalistic processes are incapable of generating information. The only type of cause known to produce information is an intelligent agent. The best explanation for the origin of life, then, is an intelligent agent that transcends biological life (God). God is not being offered to plug up a gap in our knowledge, but as the best explanation for what we know to be true about life. Ironically, it is the naturalist who is usually guilty of invoking a gaps-type argument. Rather than invoking God for what he cannot explain, he invokes nature. We don’t know what can explain the origin of biological information? No problem! Nature did it…somehow. We don’t know how to explain the origin of material reality? No problem! Nature must have done it…somehow. Naturalists are so committed to the notion that natural causes, and only natural causes exist, that even when we have exhausted every natural cause and found them all wanting, they remain committed to the belief that there must be a natural cause. This is a “nature of the gaps” argument in which nature is invoked to plug gaps in our knowledge. So the next time someone accuses you of making a God of the gaps argument, explain the difference between invoking God to explain what we do not know/understand and invoking God as the best explanation of what we do know/understand. God is the best explanation for the origin of the material world, the origin of life, morality, the laws of logic, free will, etc. We invoke God to explain these phenomena, not because we are unaware of possible naturalistic explanations, and not just because we have found all naturalistic explanations wanting, but because the existence of God best explains these features of reality. Jason, excellent post, once again ! I would add that if non-believers insist on a natural explanation for the origin of the life, the burden of proof is on them to produce evidence that nature can itself produce information by itself and then be able by experiment to demonstrate how this happens by a series of clear experiments which shows without any doubt that nature can produce information where no information existed. Believers on the other hand already have an explanation, God did it ! This is not a cop out but rather a position that God has omniscient power to create and provide the necessary information for the existence of life. As Jason pointed it, it is the best explanation for the existence of complex information in the biological world. Since we cannot manipulate God at our own whims to produce the kind of “proof” that the unbeliever is looking for, there is NO burden of proof on the believer to prove that God did it. The believer’s position dictates what measure of proof he is responsible for. On the other hand for those who subscribe to a naturalistic theory, there is a great burden of proof required on their part to scientifically substantiate their claims since their position forces them to produce such evidence since they do have complete access to the natural world. With all the string theories and such there still is no purely natural explanation to the origin of life and there will never be such because it is nonsensical to think that the natural world can have a natural origin. So the burden of proof for the naturalist is very very heavy that he will not be able to bear it in the end. This they bring upon themselves because they have chosen their position and their position dictates the burden of proof required. I know someone who once said something about a heavy burden…. I want to publish some passage from your post on my blog; will you allow me? We have quite a wide gap ranging from there is no God to God is responsible for everything. I believe God is in control but doesn’t control everything (ie. free will is in effect and as long as His plan is unfolding as req’d He only intervenes when He wants too). Over recorded history we have seen things once believed to be supernatural to be explained by science. 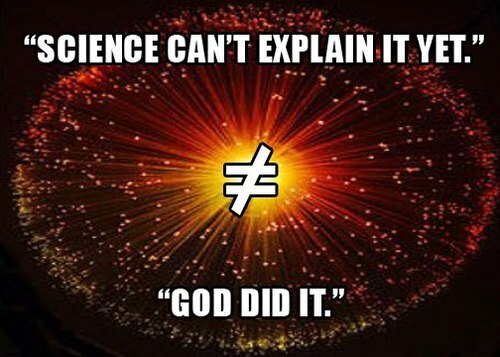 Science presently cannot explain everything though. However, it is amazing how knowledge is increasing these days. Will science one day explain all the big questions in the realm of the natural? As a theist I believe not. I find looking for answers to some of the how questions in the Bible can be problematic though. IMO science is an ally not enemy of the theist even though when certain Biblical stories are compared to science they don’t seem to jive (eg. creation story: plants created before sun, birds created before animals; other stories with the sun standing still or going backwards in the sky; etc…). So does the Bible help or hurt the theist argument? I guess if every word is taken literally it would hurt, if supposed to be taken literally in part only not. I find stories of ancient mysteries (ie. Mayan calendar, Stonehenge, Antikythera mechanism, Greek fire, etc…) very interesting. What other knowledge was lost over the generations possibly do to some supernatural, natural or man made catastrophe? Was there some huge dark age brought about by this event? There is still much to learn. I’m suprised to learn of scientists theorizing of other dimensions and parallel universes. To my fellow theists I would say — maybe some time stuff just happens in this world and to the atheists I would say — if you don’t believe in theism because by definition it can’t be tested scientifically then if a scientific theory can’t be proven by experiment maybe it’s not true. Paul, nice post, you make some good points. I also believe science is an ally to the Theist as the complexity we are now discovering in the natural world points more and more to an intelligent designer and not random chance as some believe. Regarding your statement that the bible hurts the Theist argument, I respectfully disagree with you. There are numerous accounts where the Lord has temporarily suspended the laws of physics or changed them to achieve His purposes. If I believe in God I would expect some supernatural content in the bible such as creation, miraculous healings, violation of the laws of nature, resurrection from the dead 🙂 etc… If the bible did not contain these things, I would have a hard time believing an all powerful God existed. 13) Our bodies are made from the dust of the ground (Genesis 2:7; 3:19). Scientists have discovered that the human body is comprised of some 28 base and trace elements – all of which are found in the earth. 14) The universe had a beginning. Starting with Einstein and confirmed today, plus mathematically negative infinity is impossible in the physical world. 16) God has created all mankind from one blood (Acts 17:26; Genesis 5). Today researchers have discovered that we have all descended from one gene pool. 17) Circumcision on the eighth day is ideal (Genesis 17:12; Leviticus 12:3; Luke 1:59). Medical science has discovered that the blood clotting chemical prothrombin peaks in a newborn on the eighth day. This is therefore the safest day to circumcise a baby. How did Moses know?! 20) The order of creation agrees with true science (Genesis 1). Plants require sunlight, water, and minerals in order to survive. In the first chapter of Genesis we read that God created light first (v.3), then water (v. 6), then soil (v. 9), and then He created plant life (v. 11). 21) The Pleiades and Orion star clusters described (Job 38:31). Yes, for those who take the Bible literally creation occurred exactly as stated in Genesis. It never rained before the flood, the Earth was watered from below. Most likely at the time of the flood is when the only land mass broke up when the water underground burst up into the sky and flooded the whole Earth. From then on the Earth was watered by rain and we have the rainbow as a sign that God won’t destroy the Earth by a flood again. But as you know, God will destroy the Earth by fire before the new Heaven and new Earth are created. And in one instance God supernaturally caused the sun to stand still in the sky then on another occasion caused it to go backwards. Any scientific evidence contrary to this is wrong. Since I’m a theist this could be possible but I don’t think so. As you know, I believe the Bible but take some of these Old Testament Scriptures more symbolically than literally. I don’t believe in The Theory of Evolution (ie. “from goo to you — via the zoo”) nor do I believe the creation story in Genesis is how God literally brought about creation. However, I believe in natural selection, survival of the fittest, variation within similar groups do to mutation which are facts not theories. If the Bible is to be taken literally are we supposed to follow the OT and stone the guy to death who was found picking up sticks on the Sabbath or not to stone him because we are sinners too like Jesus Christ said in the NT? Paul, I also believe in natural selection and variation within species groups. This is all good science and we don’t need to part with that in order to believe that God did some supernatural things beginning at creation. 1) First of all, the law was given to Israel, not us, we are Gentiles, so it could be argued that those laws, in particular the laws of the Sabbath do not pertain to us. This is a whole other topic, but God’s people in those days was a specific nation and to belong to God you must be part of Israel or have allegiance to them. 2) Second, the NT supersedes and fulfills the OT in Jesus Christ. So again for this reason we don’t stone the guy who picks up sticks on the Sabbath. By the way, there is another separate discussion on the Sabbath which we can’t get into here. As Christians, we have no command to observe one day more special than another. As for taking the bible “literally”, I cringe when I here this because it implies reading the bible with no understanding. Taking the bible literally means that we accept the scriptures and their narratives at face value concerning historical events. Surely there are also many literary styles in the scriptures in terms of poetry, imagery, metaphor etc… and these should be understood as such. Regarding Genesis, I think you take it as a more metaphorical rather than in a literal sense. I take Genesis more literally than you but I’m not going to turn it into a scientific text book either. The reason for that is that there are other references to the literal creation in other parts of the bible as in the NT where Paul and Jesus refer to it. The law of the Sabbath for example is based on a literal 6 day creation. Also, the doctrine of salvation cannot make any sense without the Genesis creation. Let me take a step back perhaps I’ve misunderstood you. My previous point is — the atheist takes the Bible literally because many Christians take the Bible literally. If I understand your position: generally speaking, you take it more literally than me but more symbolically than others. So if in the creation account God creates plants before the sun and birds before animals and some scientific evidence/reasoning contradicts the literal account that is no problem for theists but for the atheist is proof or at least indicates problems with the Bible. That is why I asked if the Bible hurts the theist argument. Could science be wrong? Possible, been wrong before, but IMO the reading I’ve done indicates the sun before plants and animals before birds. It was off topic, but I asked you the question about stoning the guy picking up sticks on the Sabbath to see how you would answer as an indication of what you take literally. Interesting answer, I kind of agree but disagree a bit if I understand you properly. Sounds like you give more weight to Grace than do I and less weight to Law then me. If you agree with St. Paul re: Grace vs. Law, than I agree with you. Paul, again you make some good points and thanks for the clarification. In reading your response I realize it’s difficult sometimes to convey one’s viewpoint clearly through these posts sometimes. So that said, I’ll try to clarify where I stand on these things. I see what you’re saying now about the bible hurting the Theist position. I agree with you that being absolutely literal can give the impression of contradictions. Regarding what’s created on which day, I haven’t looked at that in a while to make a comment. However, based on what else I believe from the scriptures, I would think that the order of the creation as written would be true and if there are any apparent contradictions to science, I think we should probably give some room for play here since this is the very beginning of the physical universe and earth. There could be a lot of things we don’t understand scientifically with what was going on at that time of creation. As for Law vs Grace, yes I agree with Paul. I find it difficult to explain some positions in this type of forum too, but here goes. My big picture on creation can be summed up in three main points: 1. In the beginning God created the heaven and earth 2. Man is created in God’s image 3. Man fell. So of the Who, What, Where, When, Why and How. For me the when and how are up for grabs. I can say this because I take the Genesis account symbolically. IMO, similar design is evidence of a designer not Darwinian evolution. We know from observation some creatures have a common ancestor (ie. dogs). I believe great apes like dogs may have a common ancestor also. There may also have been similar but different types of creatures that became monkeys or great apes. My research has lead me to the conclusion birds share ancestors with land dwelling creatures though, probably reptiles. There may have been different types that say became birds of prey and others that became game birds. So did God will creatures into existence totally complete or use a process like evolution guided by His will or have angels genetically engineer life or a combination of these or something else? I don’t know and probably never will in my life time. Paul, as I mentioned I take Genesis more literally although I would say that I take it as more of a short summary rather than a detailed dissertation on the creation of the universe. That said, from my viewpoint I don’t think the manner in which it is written is symbolic as it does provide some detail as to what is created and when. As a comparison, a good example of symbolism can be found in the book of revelation as we not only see symbolism but a lot of vivid imagery. When you look at the context of Revelation though you realize that this is John describing visions and dreams so there is a reason for the symbolism and imagery. In Genesis, I don’t see this, rather I see a creation account that perhaps lacks some detail that maybe I would have liked to see. However, everything it describes is factual and real like day/night, birds, animals, Sun, Moon, Man etc…. 1) Is Adam and Eve symbolic to you or do you believe they are actual people that lived in the beginning ? 2) Based on your view that some birds have ancestors that were reptiles, how do you reconcile that with Genesis stating that creatures developed after their own kinds? Also, given that new genetic information is required for a creature to sprout wings and fly, if not by Darwinian evolution, by what process do you think this has taken place and do we still see this sort of transformation today in nature? I’m curious to your responses. Thanks. Darwin’s Theory is not possible to prove because by definition it can not be observed because it takes too long and I think it is false. As I said in previous posts things like natural selection, survial of the fittest, variations within similar groups due to mutation is not evolution as I define it and these we agree on I believe. After much study I asked myself this question: Did God dictate or inspire the Bible? I came to the conclusion God inspired the Bible. I take parts literally and parts symbolically. I not only look to the Bible to understand this world, I look at creation itself. Adam and Eve; Yes I believe in Adam and Eve as do you. However, I may have a different picture in my mind then you how God created them. The Biblical account of Adam’s creation on it’s own doesn’t give a person much to go on. When much younger I imagined God fashioned a humanoid figure out of clay and supernaturally gave this figure (ie. Adam) life not giving much thought after that. I never gave the creation of Eve much thought until several years ago. I looked at the creation account of Adam and Eve for clues into the Incarnation of Jesus Christ and Immaculate Conception of Mary. As I said Adam’s creation didn’t help me but Eve’s creation intrigued me. Why wasn’t Eve created like Adam? I get the symbolism but it doesn’t make sense. Then it seemed to me as if the account of Eve’s creation is actually genetic material being taken from Adam and genetically engineered to create Eve. This made me reconsider my much younger thoughts of Adam’s creation. So I asked myself, did God use Angels in creation? If another theist has a different interpretation that’s fine with me, my interpretation hits all the bases IMO. Birds, I didn’t re-read my previous posts but I’m not saying like doesn’t beget like. I’m not saying a frog grew wings and flew. I’m not saying flying fish became birds. I’m not saying a reptile became a flying squirrel. I’m saying the reptiles that could fly are ancestors to birds like a ancient canine creature is the ancestor of domestic dogs. Common ancestors have all the req’d DNA in them to create the diverse set of ancestors as did Adam for his human ancestors. So for humans and creatures as I’ve said, the process by which creation occurred is unknown to me. Darwin’s Theory and the Genesis account don’t make sense to me when looking at what was created. I think we both agree on Darwin. As for the Genesis account, as I read it doesn’t make sense. Maybe I’m confused but what I did is look what was created in what order and it doesn’t jive with what I see in God’s natural world. correction to my last post; got descendants and ancestors mixed up in some spots. I guess I don’t really understand the issue you have with the order of creation. Maybe I haven’t examined it as close as you have but if we take the 6 day period to be a literal 6 days does the order even matter ? Maybe I’m being too simplistic, I don’t know. For example, if the plants were created “as is”, that is already grown, could they not last until the Sun was created ? I’m trying to understand the how and when of creation. Does the how and when matter? to me it does. Basically, if the order in Genesis is literally correct I’ve got a lot of re-figuring to do. I think the order is symbolic though based on science and my thoughts. It doesn’t jive to me, but as you say the plants could last till the sun was created according to Genesis because there was light in verse 3. Let me try this to help explain my thinking: What is the light God created in verse 3? Is the light in verse 3 symbolic? Before the sun is created how long is a day in Genesis? What does it mean by the greater light to rule the day? Is this greater light our sun? Does the sun produce the day light in Genesis? Or does the light God created in verse 3 cause the day light? I’ve looked into these questions but for me I keep coming back to the creation account in Genesis being symbolic. There is no acceptable purely literal interpretation of the origins account that does not require imagined details that appear to contradict the plain text. We know this because of Genesis 3. The serpent was a clever beast, not an angel in a snake’s disguise or possessing a snake. The serpent was blamed, and given a curse appropriate for a serpent (crawl on belly, inhale dust, bite at man’s heel, etc.). Later, in Wisdom and then Revelation, we’re told that Satan IS the ancient serpent. The truest possible interpretation is that the origins serpent was an allegorical figure for the angel Satan and something he did. This asks us to apply the serpent’s curse to Satan by means of metaphor, which is what Christian thinkers have historically done (often applying the “bite/crush” to Christ). Everyone should read Origen’s “De Principiis Bk. 4.” It’s a 3rd century work that articulates the degree to which we MUST take the Bible figuratively at many junctures. Google for “stanrock origen sermon” for some pertinent passages. As far as the “naturalism of the gaps,” we should embrace methodological naturalism as Christians because it is reckless and imprudent, when seeking an explanation for something, to invoke God’s work through exceptional miracles when God actually worked through the teleology of natural events. Google for “stanrock relentless robot” for a thought experiment that clarifies.